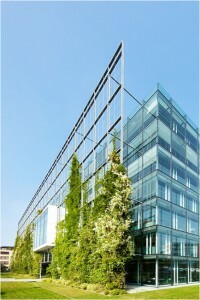 Plant selection is paramount for the success of a green facade. While having a proper climbing structure such as the options you’ll find in the Tensile product range is important, it is understanding the position and micro-climate of the site that should drive suitable species selection. Add in a sound comprehension of the types of suitable climbing plants and you have the recipe for plant prosperity and green façade success. 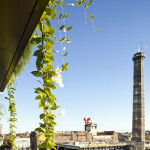 Climbing plants that work their way to the light make them the perfect choice for these types of projects. Let’s look at four categories of climbing plants that are suitable for vertical garden walls and get a feel for how, when and where these plants work and grow with particular support structure and environments. Twining species such as Chinese Wisteria, Star Jasmine, Native Sarsaparilla, Wonga Wonga Vine and Madagascar Jasmine work best with vertical stainless steel cables and tend to be quite hardy. The vertical positioning of the cable allows the plant to coil and loop its way around in a circular motion. Multiple vertical cables can used with the distance between determine by the density of the planting required. 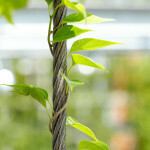 Sometimes called tendril climbers, plants such as Kangaroo Vine, Passion Flowers and Orange Trumpet Creeper prefer a cross-hatch of vertical horizontal members. This provides ample locations for the plant to spread out and attach to. With abundant foliage and diverse flower options, these plants can bring substance to a living green walls. Many scrambling plants will not reach the heights of other types listed in this article but equally have their place in living wall gardens. They work beautifully at the base of large facades or on their own on smaller structures. 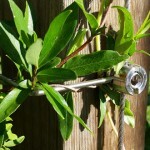 Horizontal cables are perfect for plants such as Bougainvillea, Lade Banks Rose and Cape Honeysuckle. These species are great for their capacity to handle a warm climate. It’s also good what not to plant too. 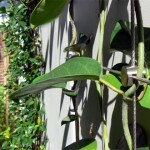 Adhesive suckers and root climbers aren’t a good option for vertical garden walls because of the tensile elements used when building a vertical garden being made from stainless steel cable. The stainless steel lacks the porous material these plants need to help them climb. Stick to the three categories we talked about and make sure species selection is made after thorough analysis is conducted by a landscape consultant prior to selection and installation. You want to be sure that the climbers don’t bolt to the top and leave the bottom of the structure threadbare. 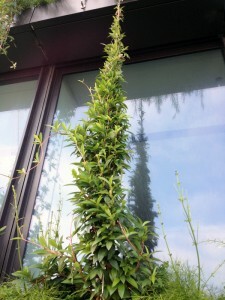 Also remember there is a direct relationship between the climbing plant and the structure that will be supporting it. This is another vital part of the selection and installation. 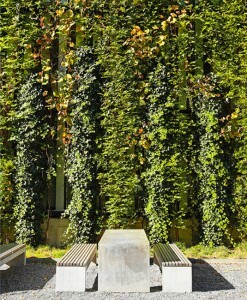 With careful species and trellis selection and ongoing maintenance, the result will be a fantastic lush vertical garden wall with its benefits of amenity, sun-shading and cooling. 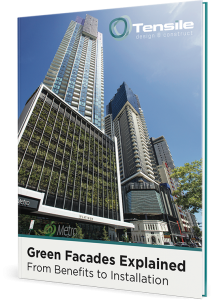 For some examples of completed Green Facade projects, click here. You can also view our Jakob Inox Line Green Solutions Catalogue here. 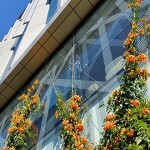 Tensile Design & Construct offer a full service from conception through to installation on all scales of green facades. Contact us today for further information.